I've decided to put the cover here after these first four pages because when I was scripting out the chapter, the first four pages with Kasumi felt more like a lead-in to chapter 2 because they're rather disconnected from the main storyline right now. So the cover art serves as a sort of break indicating that the storyline from chapter 1 is continuing after the interlude with Kas. I've sort of got a weakness for photo collages. Or drawing them, anyway. I think that, given the nature of this story, showing documentation of the characters' lives before the beginning of the comic and during the course of it sort of tracks their development and we can look back ten, twenty, thirty chapter form now and see how much the characters have changed and grown over however many years the story takes place over. 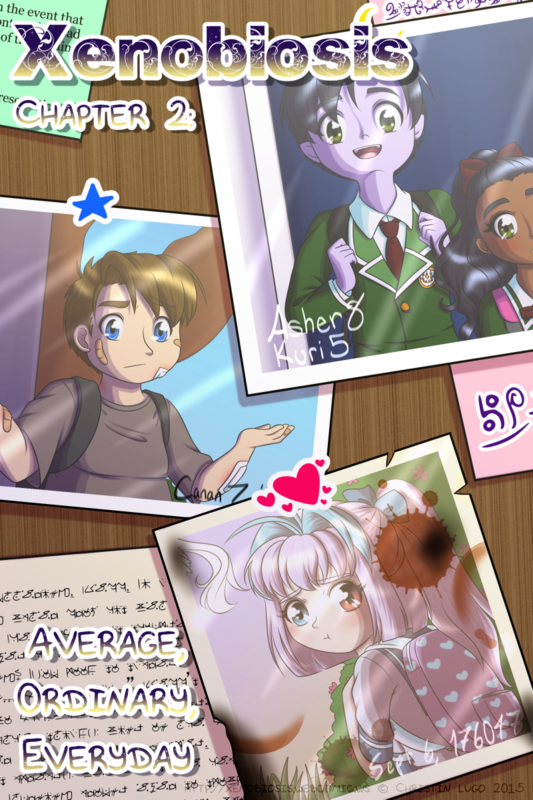 So I drew everyone as kids! Because I really enjoy drawing kids but most of the stories I plan can't really work with leads younger than like... 13, 12 at the least, because they usually involve a lot of the characters transitioning from teens/adolescents to young adults. And I feel that kind of character age range is easier for me to write because I'm at that stage in my life where I'm trying to grow up and come into my own and figure out who I am and what I want and all that jazz, so I have experience in quite a few of the things my characters would go through developmentally. I mean, it is only one point of view I'm working with and my own unique set of experiences growing up but it's what I know. And everyone always says "write what you know", so I try to do that. Anyway! Here we have Lilith when she's around 7, Canan when he's 7, and Asher when he's 8 (and his little sister who was 5 at the time that photo was taken). I did debate if I wanted to give Lilith an actual photograph or not given that she's actually 1000+ years older than Canan and Asher, but in the end it's obvious I chose to give her a photo too (though I did try to make it look super old and faded like it's seen a lot of wear and tear). There's an actual comic page coming on Thursday I swear, please don't be mad at me for posting it like this. Why would we be mad? It's a really good cover. I mean it has a tiny Lilith with a "I don't wanna go to school" look. Just how old is she anyway? And what did Canan do to get all those cuts and bruises? Canan was probably just playing outside with some kids and got beat up or something. I don't remember exactly my reasoning for giving him all those injuries but I do remember that I decided he was a kid that always had scrapes and cuts and bruises. And Lilith is... 7 for her age, but in human years she's like... 708 years old? Mythele age/mature at a slower rate than humans. ... so they seriously age 100x slower from start? They spent 75 years before starting to walk? ... usually, species like this grows at roughly same speed and then it slows like around puberty or something. Yeah, I tried playing around with black and white and sepia colors for her photo but I didn't really like either of them. And yes, they do age 100x slower than humans, but they perceive time differently so to them, humans have really really short life spans rather than them having really really long ones. We already know they don't move 100x slower. Lilith talked to Helen and Helen talked to Asher, even 10% difference in their speed would be noticeable. Are they prone to periods of freezing or spacing out? Do they learn really slow or keep forgetting? Do they need more time than humans to enjoy a 2 hour movie? Like, 200 hours? ... or did you just not though about it? Wait: Maybe they sleep a lot and are only awake for 16hours/100 = 10 minutes per day ... hmmm ... doesn't sound likely either. Winter sleep? No matter what, it seems that they manage to do much more that humans in their livespan. Which wouldn't be problem for adults, heck, even teenagers would have enough things to spend their time on, but toddlers? All the childhood memories! Except that one really embarrassing thing that happened 8 years ago, that can stay forgotten. Well, given that it's been burned a little, I wouldn't be surprised if that was bloodstains on it too I actually don't remember what the splatters were supposed to be but the curved stains are definitely meant to be from a coffee mug. Yeah, I thought it was coffee.